On Martin Luther King Jr. Day 2013, which also happens to be President Obama’s second inauguration, like many in the media, I’m irresistibly drawn to compare and contrast the two men. I’m not angry about Obama being sworn in on MLK’s bible. I’m a strong Obama supporter and I think by historical standards of American presidents, he’s been great for progressives. But Barack Obama has done a good job as an American president, not as an American social movement leader. As much as the Obama team has adopted the language of organizing, as much as he painstakingly emphases passages in his speeches like “this has never been about just one election” and “this campaign belongs to you”, Barack Obama left the community organizing business decades ago. He inspires people to come to events to see him speak, and to wait in lines to vote for him. He can claim the most “liked” picture in Facebook history. But he does not inspire people to march on Washington together or engage in civil disobedience to demand change (except the Tea Party). Not a personal failing. That’s just not what presidents do. Barack Obama is not our Martin Luther King. 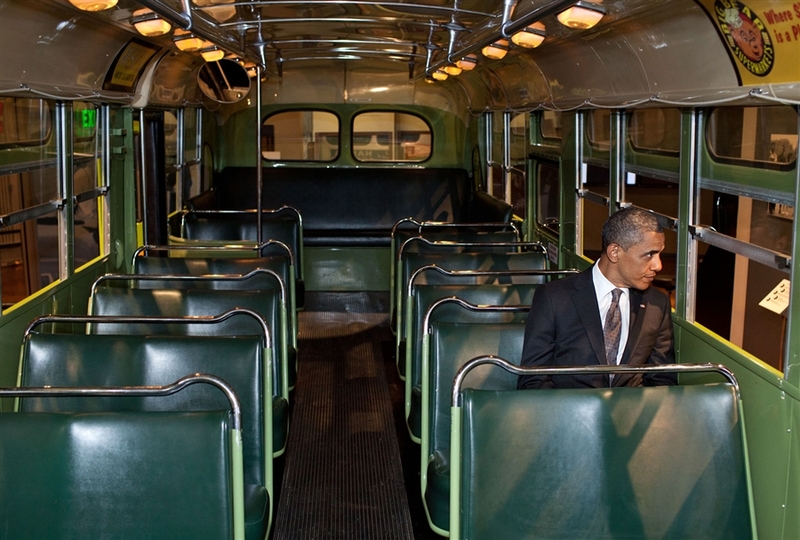 Barack Obama is our Lyndon Johnson, to a yet-undiscovered Martin Luther King. I’m really interested in his new organization that he’s been asking his supporters to join, the revamped OFA– Organizing for Action. I think it could be an innovative tool for advancing the president’s legislative agenda in Congress– it’s got a big list and can probably generate insane numbers of phone calls and petitions etc. But I don’t think anybody seriously believes it’s going to be a movement-building organization like MLK’s Southern Christian Leadership Conference. It’s run by people with the Campaign Brain, and will never be truly independent of the Democratic Party, will never have people willing to be beaten and jailed and shot for it. “In the ghettoes of the North over the last three years — especially the last three summers, as I have walked among the desperate, rejected, and angry young men, I have told them that Molotov cocktails and rifles would not solve their problems. I have tried to offer them my deepest compassion while maintaining my conviction that social change comes most meaningfully through nonviolent action. He could take unequivocal stands for justice without having to hedge his words while simultaneously awkwardly holding the reins of a government whose laws dictate separating undocumented immigrant parents from their children and sending suspected enemy combatants to detainee camps. The leader of a movement cannot also be the Commander in Chief (unless his name rhymes with Schmitler). We don’t seem to have our time’s Martin– a powerful, independent, multi-issue voice of the American Left, committed to organization and movement building. Maybe instead we have an equally important behind-the-scenes figure that I’m too inexperienced or unimportant to know about– a modern Ella Baker or Bayard Rustin. Maybe the army of paid staff of advocacy organizations made possible by the nonprofit industrial complex has replaced our need for a few big leaders as the pillars of social movements. Maybe we don’t need leaders at all anymore because of the interwebz and tweets and whatnot. But I do feel like many of the shortcomings of progress in Obama’s first term were due to a lack of outside social movement. They were due to Obama being the face of the left, the glowing messiah of 2008 who allowed movement activists to chill out and let Barack take care of it. I believe the first black president is part of King’s legacy. But I think a new generation of leaders of organizations within an independent movement for equality, peace and freedom would be a more important legacy.